Because Apple changes their system details so much from one version of OS X to another, installing music21 is probably the hardest part of the experience. Once you have that set, the rest should be much less painful. Trust us that it should work. Though Macs come with Python, it’s a very old version. We recommend updating that by going to http://www.python.org/ and getting Python 3.6 or later. it will prompt you for your password. 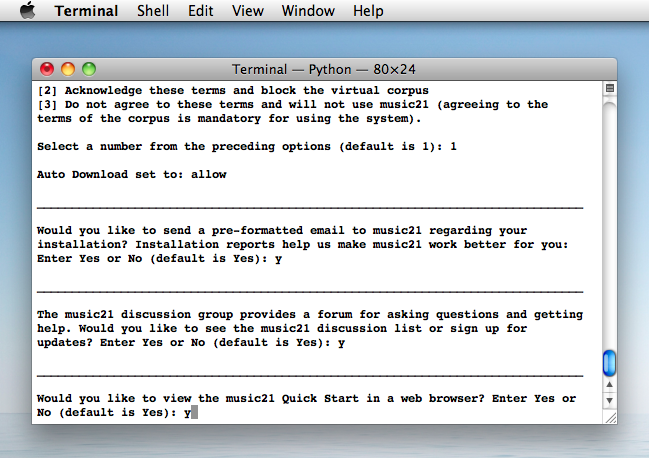 TADA: you have music21 for Python! Python is a simple but powerful programming language that music21 is written in and in which you will write your own programs that use music21 . If it says 3.4 or higher (or possibly a number like 3.4.2), you’re okay. If it says 2.4 or 2.5 or 2.6, go to http://www.python.org/download and download a newer version. Multiple versions of Python can exist on a single computer without any problems. Hopefully this should work fine. 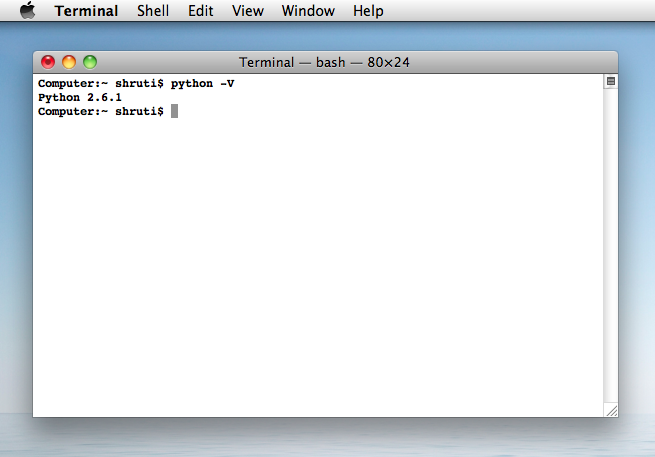 Exit python by typing quit() . Double click on the installer.command file to start. This file should open a Terminal window and begin running the Configuration Assistant. As this is a program downloaded from the Internet, the System will likely warn you about running it. Go ahead and click “Open”. After waiting a few moments to load modules, the Configuration Assistant begins. The first option is to install music21 in its standard location (see below, The Installation Destination). Enter “y” or “yes”, or press return to accept the default of “yes”. Before installation begins you may be asked for your Mac password. (The cursor won’t move or display any letters when you type in the password. Just rest assured that the characters are being transmitted). As Python packages are stored in a System directory, you need to give permission to write files to that location. During installation, a large amount of text will display showing files being copied. Sorry about the mess. Just ignore it! It means it’s working. After installation the Configuration Assistant will try to configure your setup. If you have never used music21 before, following these prompts is recommended. 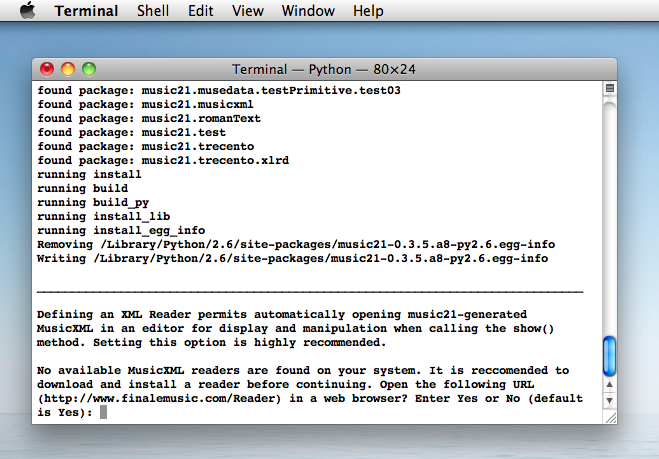 Selecting a MusicXML reader is the first step. MusicXML is one of many display formats used by music21 , and will provide an easy way for you to visualize, print, and transfer the music you edit or develop in music21 . The Configuration Assistant will attempt to find a MusicXML reader on your system. If it can’t find any, you will be asked to open a URL to download Finale Notepad 2012, a simple and free MusicXML reader and easy writer. 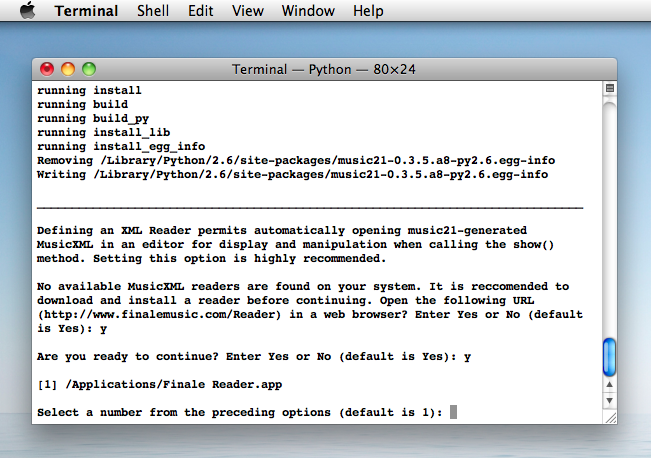 Installing this reader is recommended for users who do not have Finale, Sibelius, MuseScore, or another MusicXML reader. You might want to try MuseScore instead, which is also free and doesn’t require you to register to download it. If one or more MusicXML readers are found, skip ahead to the next instructions. 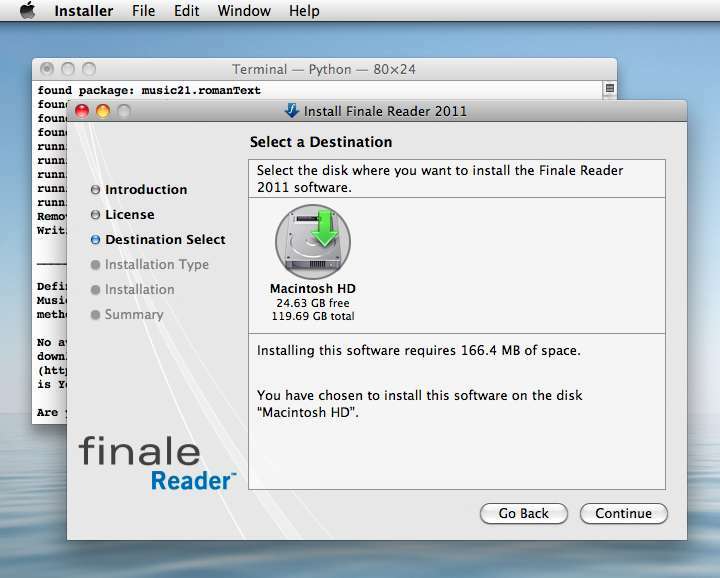 If you choose to install Finale Notepad (formerly Finale Reader; hence the pictures below), you will download an installer. Launch the installer immediately, and follow the instructions. After selecting a MusicXML reader, you will be asked a number of questions about working with music21 . They concern whether music21 can access the Internet, and whether you are willing to comply with the license for use of music21 and the included corpus of scores. You have to accept the license to continue (we need to retain some rights you know! ), but you don’t have to give us access to the Internet. After the Configuration Assistant is complete, you can close the window when it says “[process terminated]”. CONGRATS! You’re done with installing. You can delete the music21-4.0.0.tar.gz file and music21-4.0.0 folder from your desktop now. Open up the Mac Terminal (under Applications/Utilities/Terminal). You might want to drag it to the dock. You’ll use it often. 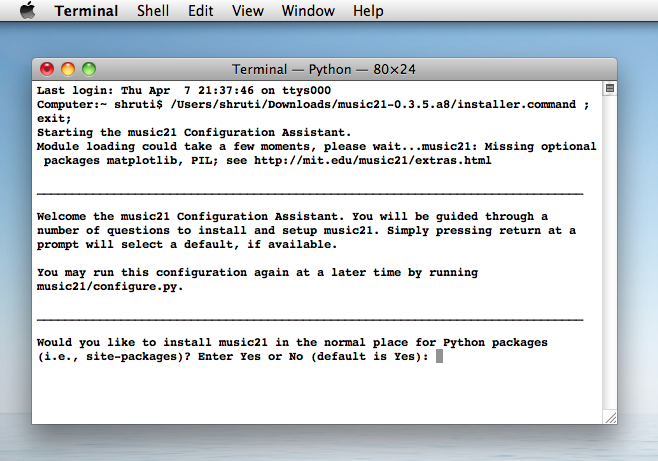 After a successful installation, you may proceed to Notes to begin using music21.